Survolez le monument national de Misty Fjords lors de cette visite touristique d’1 heure et demie en avion au départ de Ketchikan. Volez au-dessus du paysage sauvage spectaculaire tels que les glaciers, les lacs et les fjords, tout en écoutant le commentaire de votre guide expérimenté sur un casque. Le transport aller-retour depuis les hôtels de Ketchikan ou le port de croisière est inclus. Soyez prêt pour le transfert à 9:30 Depuis le port de croisière ou depuis votre hôtel de Ketchikan, puis transfert vers l’aéroport dans un véhicule de transport. À votre arrivée, retrouvez votre pilote et ayez des consignes de sécurité, puis prenez votre siège sur l’avion à voilure fixe, attachez votre ceinture et mettez votre casque. Décollez et volez au-dessus Revillagegedo Island, sur les fjords du continent, et dans le monument national de Misty Fjords. Écoutez votre pilote vous raconter des informations sur les sites en dessous et n’hésitez pas à poser des questions. Vous atterrirez sur une baie calme au milieu de la nature sauvage pour admirer le paysage depuis le sol. Vous dégourdir les jambes et prendre quelques photos, puis revenez au point de décollage pour terminer votre visite aérienne d’1 heure. 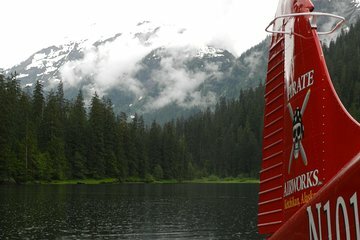 This is a popular excursion in Ketchikan and I say DO IT! We booked thru Viator and got a discount for joining their mailing list making the price exceptional :). Had an evoucher which couldn't have been more convenient. They run a tight ship at Pirate Airworks. Van picked us up exactly at the time they indicated. it was a 10 minute drive away - we walked in the office, checked in, and literally walked right back out an onto the plane. Not a moment wasted. our pilot was Dave who was great. Perfect amount of commentary, great flying. the highlight was when an eagle flew past the plane when we were in the air. it was 10 feet away from my window. AMAZING. the scenery was beautiful. just so serene. This lour was just amazing. 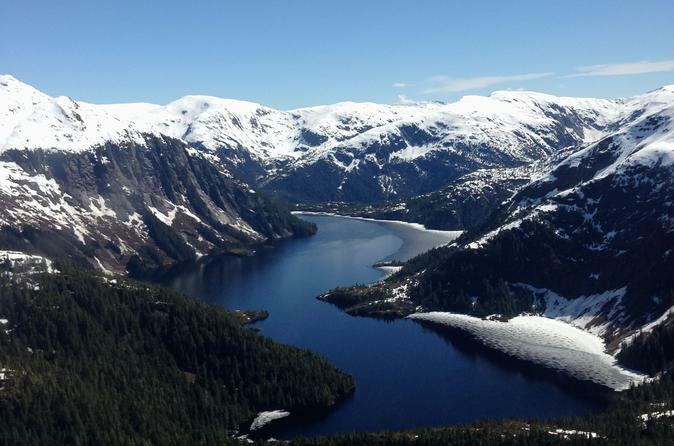 The pilot took us into the fjords and landed in a secluded area where we were able to get out and stand on the floats taking in the magnificent surroundings. Throughout the trip he provided information. The landings were so smooth we couldn’t even tell we landed. Overall just an awesome excursion! Met us at the time arranged and drove us to place we took the flight. Everyone was very nice and friendly. The flight was great but I wish we could have seen more wildlife. The views were fantastic! What an amazing day - we even had the most beautiful sunny day with 21 degrees temperatures. This was a very expensive trip for a party of 4. It was great but the float plane was very uneventful. We literally got out and stood on the floats in a straight line. I think we all were hoping for more wildlife sightings and to go up and down a few more times. Excellent flight with Captain Kenny. My family and I really enjoyed our flightseeing tour. The sights and wildlife were amazing. Cloudy wet day but still beautiful! We had a private tour for our family of 4, that was a nice surprise. Pilot was friendly, and we also landedon a lake and took off again. Great smooth flight. Our favorite shore excursion!